Alien moons around distant worlds may not possess magnetic fields strong enough to protect extraterrestrial life from radiation that may blast it from deep space and nearby stars, researchers say. The images that most likely come to mind when thinking of life-bearing alien moons are those of the forest moon of Endor in the "Star Wars" universe or Pandora in James Cameron's movie "Avatar." Astronomers might soon be able to spot real exomoons and scan their atmospheres for key signs of life as we know it, such as oxygen. However, as large as exomoons could get — some might reach at least twice the mass of Mars — models of their formation suggest they could never get near the mass of Earth. Because of this size limitation, exomoons probably cannot form magnetic fields of their own powerful enough to shield any life on them from cosmic rays emerging from deep space or intense radiation flowing at them from their parent stars. 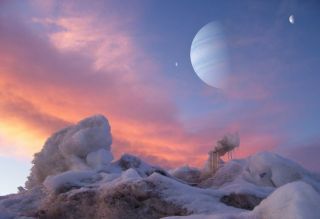 Exomoons could have another magnetic field source, though, which might emanate from the giant planets they would orbit. These planets are surrounded by magnetospheres, bubbles of plasma created by stellar winds crashing into the magnetic fields of planets. These magnetospheres can be huge — for example, Jupiter is surrounded by a magnetosphere up to 50 times the size of the planet itself, or about 2.1 million miles (3.5 million kilometers) from the surface of Jupiter on the side facing the sun. To explore this possibility, scientists modeled planets similar to Neptune, Saturn and Jupiter in the habitable zone of a sun-like star with moons the mass and diameter of Mars orbiting them. Larger moons are unlikely to have formed around even the largest planets, while smaller moons will not be easily detected by current telescopes in the near future. The researchers discovered exomoons would generally only be shielded by their planets' magnetospheres if they lay outside habitable zones. In other words, these exomoons could be in habitable zones or be magnetically shielded, but not both. "Habitable environments could be less common in the universe that previously thought," study author Jorge Zuluaga, an astronomer at the University of Antioquia in Colombia, told SPACE.com. The problem exomoons face has to do partly with tides. Giant planets can exert an incredible gravitational pull on their moons, enough to trigger volcanism and heat them. If the moons are too close, tidal heating would make it too hot for liquid water on their surfaces, much like Venus. However, if the moons are too far, they would no longer be protected by the magnetospheres of the planets. Still, exomoons could still be shielded if the giant planets they orbit differ in composition from those in our solar system. For example, a Neptune-like planet that was composed almost completely of heavy elements instead of having almost half of its mass in hydrogen like Neptune would have some chance of defending habitable moons. "We have just scratched the tip of the iceberg, and there are other factors to consider and study in depth," Zuluaga said. "We need to discover the first exomoon and detect the first magnetic fields of extrasolar giant planets to gather some observational support to our findings. This is the very core of science." Zuluaga and his colleague René Heller will detail their findings in an upcoming issue of the journal the Astrophysical Journal Letters.